Fifty-five years after the University of New Orleans became the South's first university to open as a fully integrated instituion, the first African-American students are returning to campus to be honored. Civil rights activists led by attorney Alfred P. Tureaud and Ernest V. "Dutch" Morial, who later became a two-term New Orleans mayor, brought suit in federal court to allow black students to enroll at the university when it opened as LSUNO in September of 1958. Fifty-five African-American students registered and attended that first year. On Tuesday, March 19th, some of these students will return to participate in a commemorative reunion ceremony and panel discussion from 12:30 to 1:30 in the University Center Ballroom. The event is free and open to the public. 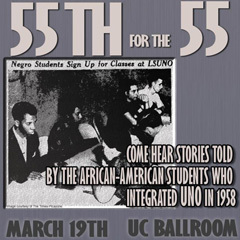 "55th for the 55" will be an all-day affair that includes a welcome session, luncheon and president's reception for the honorees and their families, as well as meetings with student leaders and the media. 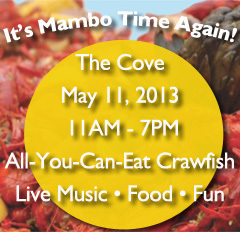 Crawfish Mambo is Coming! Got What it Takes? Missing Mardi Gras Mambo? Lucky for you, Crawfish Mambo is just around the corner! If you didn't get to Mambo with us last year, now's your chance to experience a new, uniquely New Orleans food-and-fun-filled festival on the UNO Lakefront campus. On May 11th, the Alumni Association's 2nd Annual Crawfish Mambo Cook-Off & Music Festival on the Lake will bring thousands of revelers to UNO's Cove and Sandbar to enjoy eight hours of live local music starring Big Sam's Funky Nation and Rockin' Dopsie and, of course, all-you-can-eat boiled crawfish cooked by 25+ teams competing for the Best of the Boil championship title! Think your boil's best? Now's your chance to prove it! Sign your team up now for a shot at crawfish bragging rights! Visit www.crawfishmambo.com for boiling team info and to find about sponsorship opportunities, sign up as an artist or food vendor, volunteer, buy tickets (only $15 in advance! ), or to learn more about this Mambo craze! The University of New Orleans hosts two Economic Outlook and Real Estate Forecast seminars this month, giving business leaders, investors, bankers, developers and many others a glimpse into the region's economic future. As area development continues to rebound from the national recession and housing crisis, the seminars - and the 2013 Real Estate Market Analysis - provide valuable data important for decision-makers of all kinds. The March 1st event covering the New Orleans metro region brought hundreds of influential figures to the UNO campus. A similar seminar focusing on the Northshore takes place March 22nd at the Clarion Inn & Suites Conference Center in Covington. Next fall, the University of New Orleans will offer in-state tuition rates to first-year, out-of-state undergraduate students who meet eligibility requirements. According to UNO president Dr. Peter Fos, the Privateer First Year Scholarship will help the University cast a wider net in attracting students from across the country and beyond. "UNO features a dynamic and diverse student body," said Fos. "We are pleased that we can make the University more accessible to an even greater number of students." Valentine’s Day marked the long-awaited opening of Charcoal’s Gourmet Burger Bar, the upscale build-your-own-burger concept occupying the sleek new construction at the uptown corner of Magazine and Jackson. Though the idea of a better burger has found its footing throughout the city, Charcoal’s was conceived as a business plan more than half a decade ago when Blaine Prestenbach (BS, Business Administration 08) was still a student at the University of New Orleans. Ervin Johnson (BA, General Studies 96) joins eight other sports figures in the 2013 class of the Louisiana Sports Hall of Fame, the first to be welcomed into the Louisiana Sports Hall of Fame Museum in Natchitoches. Johnson played at The University of New Orleans from 1989 until 1993, leading to a 12-year career in the NBA. Playing for teams including Seattle, Denver, and Minnesota, he amassed 3,473 points, 5,148 rebounds and 1,087 blocks over a span of 845 games. During those years, Johnson found time to complete his degree, accepting his diploma during a graduation ceremony for which he served as the commencement speaker. The College of Liberal Arts has orchestrated a full calendar of events for Spring. The UNO Jazz Studies Program kicked off the Spring 2013 Jazz at the Sandbar series with a few of its own: Masakowski, Peterson and Atkins, plus special guest alumna Sasha Masakowski. Be sure to mark your calendars for Alumni Night at J@TS on April 10th, when alumnus saxophonist Rex Gregory brings his diverse stylings back to campus. March 20th marks the opening of Theatre UNO's Jumpers: A Play in One Act, written by Tennessee Williams Literary Festival's One-Act Contest winner Jessica Alexander. This year the festival, co-founded in part by Homer L. Hitt Distinguished Alumni power couple Errol (PhD Political Science '83) and Peggy Scott Laborde (BA Political Science '75), runs the same weekend with workshops and performances throughout the city.